Taylor Robinson, president of PLG Consulting, traveled to Houston, Texas to attend Petroleum Connections’ 4th Annual Frac Sand Industry Update conference in February 2019. In the following, Robinson shares his thoughts and reflections about the conference. I had the privilege of moderating the panel discussion entitled “Unintended Consequences of Direct Sourcing” at the Petroleum Connection’s 4th Annual Frac Sand Industry Update at the Petroleum Club in Houston. The conference drew a sellout crowd of 200 attendees from all aspects of the industry. The overall mood of the conference was cautiously optimistic as the oil and gas (O&G) producers have maintained their spending discipline, not overspending in 2018. Most industry experts see a subdued first half of 2019 and are hopeful for second half growth in completion activity. This is in contrast to a year ago when drilling and completions growth was humming and seemed boundless. And then, in the spring, the Permian Basin pipeline constraint reared its ugly head and quickly slowed down the momentum. Panel Highlights: "The Unanticipated Impact of Direct Sourcing Sand"
PLG was chosen to lead the “The Unanticipated Impact of Direct Sourcing Sand” panel due to our considerable direct sourcing consulting experience. I had two great panelists with 4+ years of real-world experience in frac sand direct sourcing – Jennifer Barton from Southwestern Energy and Guy Baldwin from Chevron. fear of adding risk – what if we shut down the well? Producers are starting to prioritize service and responsiveness from suppliers versus a price-only decision – a recurring theme during the conference. I view this as a positive step as the exploration and production’s (E&P) direct sourcing process matures. The panel agreed that the various types of third-party intermediaries (consultants, logistics providers, sand ninjas, etc.) could help new direct sand sourcers speed up the process. As well, the panel pointed out examples of frac sand remaining bundled with the pressure pumper in the pressure pumpers services especially around swing crews or remote locations. Improved technology and increased direct sourcing of chemicals and other materials were noted as the next frontiers for direct sourcing. Oil and gas market experts, including Chase Mulvehill from Bank of America Merrill Lynch (BAML) and Ryan Carbrey from Rystad Energy, believe that 2019 oil prices will average in the $50-$56 range. What’s more, Rystad is assuming a $3.24 gas price. The impact of the oil price dip late last year is affecting E&P’s capital budgets for 2019. When the dust settles, BAML expects E&P capital spending to decrease by 5-10%. However, it is important to note that 50% of the E&P spend in shale is by privately-backed producers. They are the wild card and will have a significant impact on completion activity and associated frac sand volume this year. 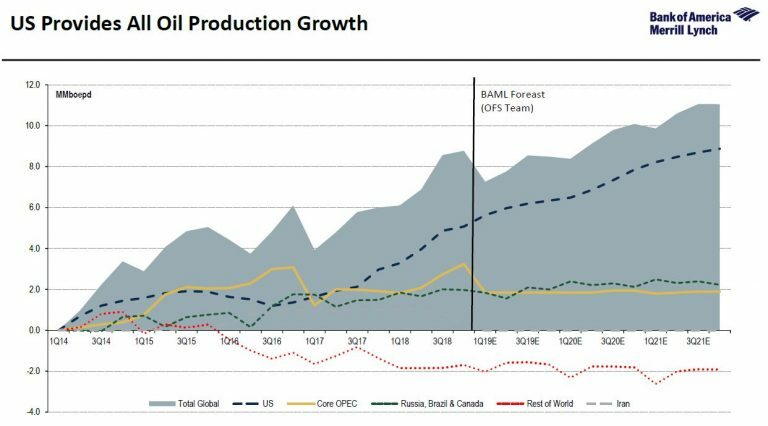 Highlighting the superiority of U.S. shale oil production, BAML believes that nearly all of the global growth in oil demand will be satisfied by U.S. oil production growth. BAML hypothesizes that in today’s world +/- $5 oil price translates to +/-100 rigs – quite a dynamic marketplace! 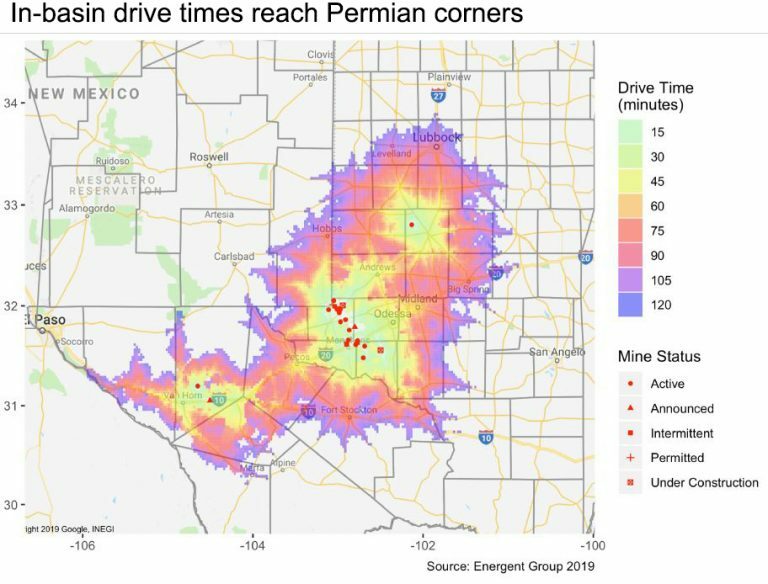 Todd Bush, the founder of Energent Group, shared some very interesting drive time analysis in the Permian. Their research indicates that a majority of the current activity is within a one-hour drive time from a dune sand mine. Among several other speakers, Erik Nystrom from Covia and Joel Shneyer from Capstone Headwaters shared their concerns with the quality and conductivity performance issues around in basin sand compared to Northern White. Erik shared his research that hypothesized that the Delaware Basin production performance has degraded by 8% since the dune sand started. Interestingly, Midland performance has remained flat since the dune sand has been used. Covia performed extended conductivity testing (14 days) that mimics long term closure pressure on the sand. Testing showed a significant performance differential between Northern White and in-basin sand. With their calculations, they believe that the oil production improvement when using NWS can pay back the savings from using local sand in as little as 30-60 days. Shneyer utilized other calculation methods which showed significant improvement in NPV over 10 years with higher quality NWS vs. local dune sand. While the technical information and lab research was intriguing, we are not seeing substantial evidence of producers sticking with NWS for 100 mesh in the Permian Basin nor changing back due to quality concerns. In fact, the Eagle Ford and SCOOP/STACK are starting to transition to local sand. 18M tons of annual capacity are coming online this year in the Eagle Ford, and 15M tons of annual capacity are coming online in the SCOOP/STACK. The frac sand industry has been dynamic since its inception. There are several volatile variables which impact the industry: global and domestic oil prices, new technology, rapidly growing end markets and an evolving value chain. So, expect the industry to remain interesting with unexpected twists and turns this coming year. The shift to local sand has been rapid with the Northern White sand market share falling from 75% in 2014 to an expected 34% in 2020, according to Rystad. And direct sourcing is becoming the norm. Not only are large producers making the transition but a growing number of medium-sized companies are switching to procure and ship their frac sand. PLG Consulting will do our best to share interesting information throughout the year in our presentations and Featured Insights. PLG’s expert consultants have hands-on experience in improving efficiency throughout the O&G supply chain. Let PLG speed up your direct sourcing process and deliver savings to your bottom line. We can provide a direct sourcing assessment and implementation plan in as few as six weeks. In addition, our expertise supports investors and developers, helping them invest wisely and mitigate risk. Contact us and see if direct sourcing is right for you.